I am so excited to share with ya'll the latest project I've done! I didn't. In fact it's hung there, bare bulb and all, a lot longer than I would like to admit. But at least there's not a yellowy orange cast all over the room now, right? Having a bare bulb was a big improvement right? Uh not so much! I eventually want to replace the fan with a pretty chandelier. But since I don't have the funds for a new light fixture at the moment, I decided to update the fan we have. I wanted to make it a little easier on the eyes while we had to live with it. So first I took off the blades. I took apart most of it to take outside to paint. I did paint one part of it inside the house. I just made sure to tape it off really well and I laid an old blanket underneath to catch any drips just in case. I gave everything a good cleaning before I painted. I used an oil rubbed bronze spray paint with a primer in it. Goodbye brass! Good riddance! Once I had the blades off, I saw that the other side looked a lot better than what was originally showing on the fan. So I decided to attach them back with the dark side showing. I then took a lamp shade I found at target a couple weeks ago. It was love at first sight with this lamp shade. I took a wire hanger and tied it around it so it would stay on my fan. It really doesn't look too pretty when you look straight up. Thankfully it's over my table so you really can't see the inside unless you lean across the table and look up. I'm sure I could probably make it a lot prettier looking inside if I wanted to. And I probably will take it off and work with making it look better. I was just so excited to get it up there, ha! 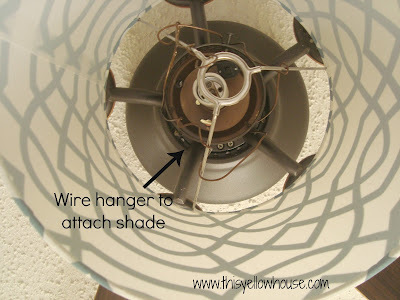 I really wanted to show ya'll this picture tho because it can kind of give you an idea how you can attach a lamp shade to a ceiling fan. Much better right? 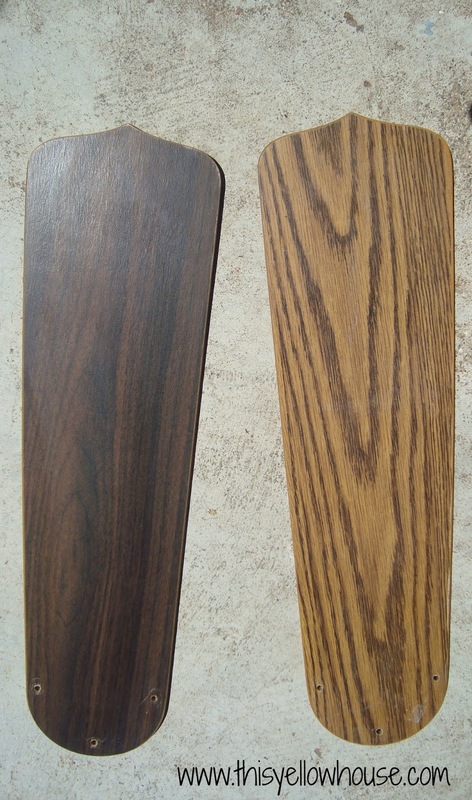 Here's a little side by side for comparison. So for $16 for the lamp shade and the cost of a little spray paint, I got rid of an eyesore. So has anyone else got rid of an eyesore lately? I have a few more in my house I need to tackle! Yes it was so much cheaper than getting a new fan! And everyone keeps telling me it looks brand new now, so glad I did it. Thanks for stopping by! That looks great! I love it! I love the change! 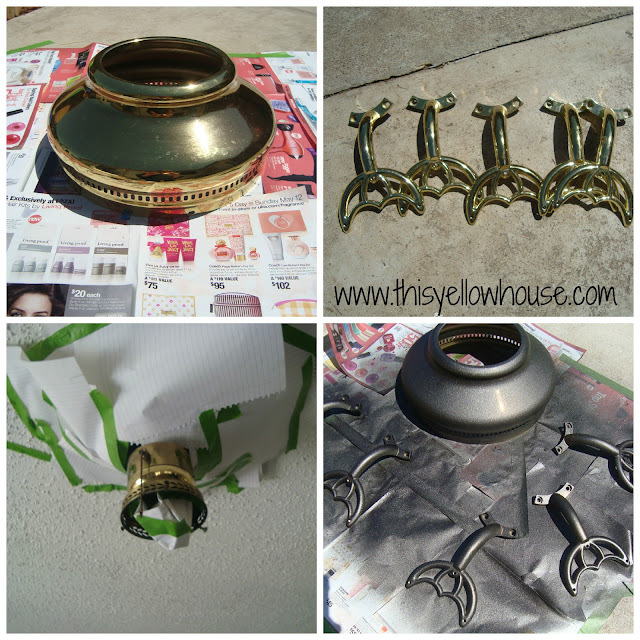 The spray paint to cover up the brass looks so good! Do you think you could paint the fan blades? White would look fun with your shade :o) Came over from What Shakin... I blog at nap-timecreations.com... would love to have you stop by. Good idea about painting shades! Thanks for stopping by! 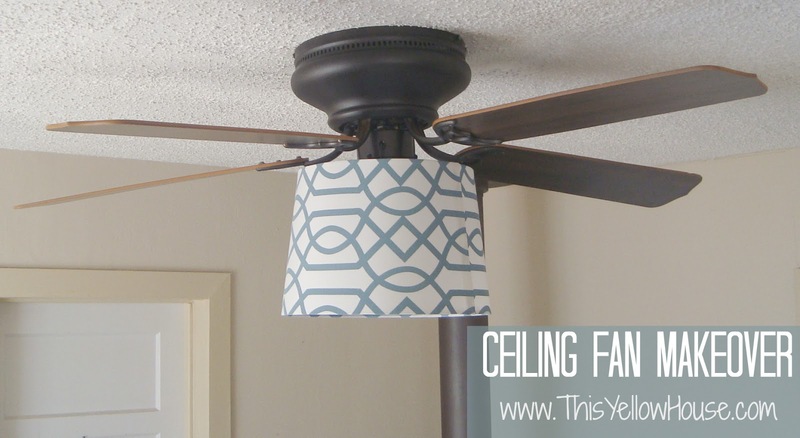 Love a great DIY makeover - this takes your room to a whole new level! Turned out great! Wow...love it! What a creative idea!! Never thought about spray painting the fan I have. I can't say how much I hate the faux brass look it has! Spray paint here I come! Thanks so much! I hate that look too! Thank you so much for stopping by! Looks awesome Allie - what a huge difference! Love it! Great job! Looks so much better. I'm visiting you today from My Romantic Home. I co-host a Linky Party Tuesdays and would LOVE for you to add this. I hope you get a chance to stop by my blog, leave a comment and Link Up, too! You did such a fantastic job!!! Now you won't even need to replace it at all! I have the same issue with a fan in my living room... you have inspired me to tackle this now! Awesome! So glad I could inspire you to tackle it! Thanks for stopping by! What a knockout transformation! from an UGLY to definitely GORGEOUS!! you go, girl! 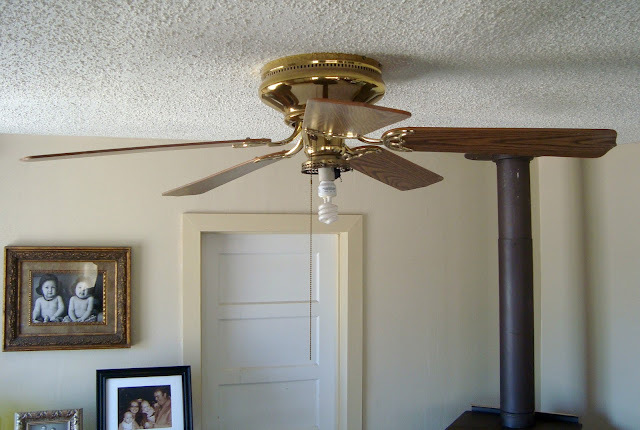 I love your idea, and had the same idea for one of my fans, but was afraid that the shade would interfere with the blades. Do you actually run that fan? I do LOVE the shade! Good Job! 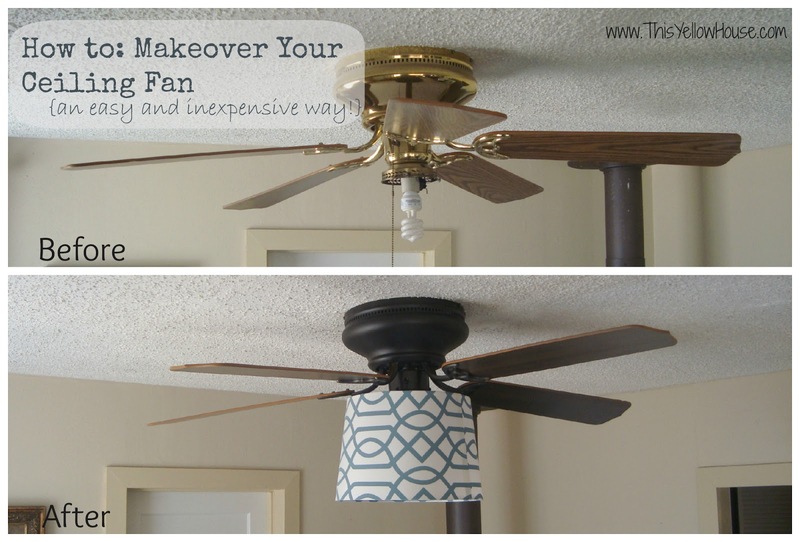 I've never thought to just redo the fan while you wait to replace. I have 2 completely offensive fans in our new house that will now be getting a face lift. Thanks for the inspiration! Do you have a favorite brand of spray paint, or did you just look for one with primer? Love it! Don't we all have ugly fans, but replacing them with a chandy means reducing air flow, so I love this solution! Does the shade spin when the fan is on? Hi Josh, Great you are thrilled with this 357. I've got one myself because like 10 decades. I like it also, maybe not modded as yours however. Currently it does not operate, it hastens if heat. Brought into a neigbour of mine and he'll discover a deeper look at it. It feels just like a few have had difficulty with the automatic decompression valve, does yours have this?